Thanks for the memories, old buddy! I recently retired my old helmet after many years of service. And by “many years of service” I mean it protected my head for three or four years, and then spent the next five or six years sitting on my head looking like it was doing something useful and allowing me to act smugly superior to helmet-shunning riders whose pride got in the way of their safety. Yes, I had that helmet for roughly nine years. I bought it while I was in college, excited to trade in my schooling helmet for an attractive, black velvet-covered one (this was just before the helmets with the skunk stripe took over—you know what I’m talking about.) But the foam core of a modern riding helmet does deteriorate over time, and a helmet’s useful life maxes out at 3-5 years. When you’re careless like I am and tend to leave your helmet in the back of your car to bake all summer long, hang it on a stall door to freeze all winter, and periodically drop it on hard surfaces, that lifespan tends to be shorter. Current helmet technology is fabulous. Riding helmets are lightweight and some designs can actually keep your head cooler than if you weren’t wearing one at all. They come in all sorts of colors and styles. You can even get ones with interchangeable strips so you can sport a sparkly pink accent if you’re so inclined. Plus, a basic schooling helmet will set you back less than 30 bucks. That’s only a week’s worth of lattes. So what’s my excuse? Why did it take me so long to replace my aging helmet? I guess I don’t have one. I never really thought about just how long I’d been wearing that thing until recently. And though fashions change and most hunter/jumper riders are now wearing some variation on the skunk helmet my friends and I made fun of back in the day, I was fairly immune to those changes since I showed saddle seat and therefore didn’t wear my helmet at shows (more on that later.) It was only after the velvet started to literally fall off that I woke up and realized that it was probably long past its prime. I mean, the torn, sagging velvet was starting to fall into my line of sight, creating this distracting blind spot above my right eye. I finally ordered a new helmet just a couple of months ago. It’s the same make and model as my old one, so I’m still sporting the classic black velvet that I like to think will never truly go out of style. And as if to make up for my helmet slackerdom of years gone by, I bought a second helmet. I found a light-colored, ventilated schooling helmet on clearance at the Rolex trade show. I got a fantastic deal, and it’s perfect for hot days and trail rides. There are plenty of riders out there who still refuse to put on a helmet. As of right now, that’s your personal choice, but times are a-changing. In yesterday’s newswire there’s a story about a new Florida law that requires anyone under the age of 16 to wear a helmet when riding on publicly owned or controlled lands, including roads and trails. For now, this doesn’t affect equestrians in the show ring, but personally, I think it’s just a matter of time. I’ve read that there are similar laws on the books in New York and Ontario, and the USEF already requires riders to wear ASTM/SEI approved helmets when showing over fences. 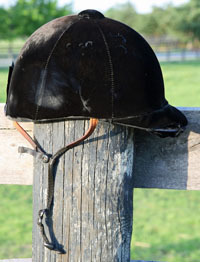 For saddle seat riders, western riders, and those of you who still insist on wearing “for apparel only” hunt caps, we might as well get used to the idea of wearing helmets, even in the show ring. Now, this may be hypocritical since I always wore a cute* but non-functional derby when showing saddle seat just because that’s what everyone else in the show ring wears (peer pressure is a lousy excuse, I know) but I think it won’t be a bad thing if helmets do become mandatory. The USEF rule book clearly states that you cannot be penalized for wearing a helmet, regardless of what discipline you’re competing in. The only reason anyone’s wearing derbies, cowboy hats or top hats is tradition, and does it make sense to put tradition above safety? Earlier this year we asked a poll question about helmet usage here on HorseChannel. Almost half of you always wear one while nearly 20% of you never do, unless you’re required to do so. For those of you who don’t, is there anything at all that would persuade you to start wearing one? And for those who do, what influenced your decision? Leave your thoughts in the comments below. Meanwhile, I’ll be atoning for my years of derbies and expired helmets by proudly sporting my helmet hair wherever I go. I think the look will catch on. *I don’t actually think derbies are cute. I think they make us all look like we just stepped out of a time machine from 1922. **I don’t actually have a backyard, either. Pony Club & instructor always required it. After one particular acccident, my helmet could be squeezed like an accordian. Sure am glad it wasn’t my head that took the impact! 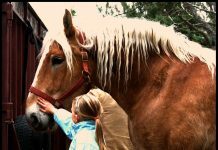 Even if you ride an old reliable, if the horse goes down (fall, bad terrain) you do too, no matter how good a rider you are! I totally agree with this article. My daughter shows Morgans at the “A” level. She rides saddle seat with a helmet. We have got no respect from the judges for her riding attire. They have actually said that it just didn’t look right. WHAT!! My child who is only 9, looks shouldn’t be in question, just her riding ability. So what did we do, at a recent regional show we did an experiment. She rode an equiation class in huntseat and 2 classes later rode equ. in saddleseat. both classes had 5 riders. She has only riden huntseat 2x’s before this too. She came in reserve champion in Huntseat and 5th place in saddleseat. Seems like it’s pretty obvious- helmets don’t fly in the morgan world unless your a hunter. BAD Choice- some child is going to get seriously hurt or killed. That’s when they’re going to change something. Why not be more proactive. PS I wish more parents wouldn’t give in to tradion but to the safety of their child.